Broadly, customer relationship management (CRM) describes the processes that companies use to compile and analyse data throughout the customer lifecycle. The goal is to improve relationships and ultimately increase sales. CRM systems collect information on customers from multiple points of contact, such as visits to the business’ website, telephone calls, online chat, social media and more. CRM software consolidates various pieces of data as well as any relevant internal documents into one database, which streamlines information management for companies. The software can also document and record different customer interactions, such as emails, phone calls, and social media correspondence, while tracking personal information, purchase history and preferences. Additionally, it automates tasks and appointments, and allows managers to monitor productivity among their workforce. Read our big brand CRM case studies to see how some of of the most well known companies in the world use CRM to improve their business practices. When managing dozens, hundreds or perhaps thousands of leads and customers, having a robust contact list is critical. You need to be able to access email, phone and other information without digging through files or other hard-to-manage software. Plus, many CRM systems let you search for customers with broad keywords, rather than entering specific details. With CRM software, it’s almost impossible to miss important deadlines. If you enter tasks into the system, it will send you an email reminder to keep you or your team on track. Many programs also sync to your calendar and remind you of upcoming events, ensuring that you allocate your time appropriately. Additionally, you can set the system to alert you of a customer milestone, such as a birthday. By sending out birthday wishes, you can improve customer relations. CRM software lets you segment your contact list in a variety of ways, and separate valuable leads from those who haven’t yet actively pursued your products and services. As a result, you can target your marketing campaigns to different segments. In turn, you save time and money by addressing only the most relevant customers, rather than trying to reach everyone at once. The more data you collect, the more opportunities you’ll find for sales. For example, by tracking the purchase history of a particular customer, you’ll get a more refined sense of their interests. The next time you launch a product similar to an item they bought in the past, you can notify them, increasing your chances of another sale, while letting customers know that you remember their personal tastes. 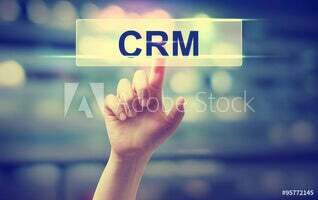 When working on a particular project or campaign, you can use CRM software to create and monitor tasks. Many systems let you establish project milestones, and allow you or your team to leave comments and attach important files as the campaign progresses. While different CRM providers offer slightly different integration options, most can share data from major applications such as Outlook and Office 365. Meanwhile, certain systems integrate with email providers like Gmail, allowing you to create dynamic email campaigns. Without analysis, CRM would just be another way to store data. Which is why all providers offer options for maximising your information. You can pull data from different fields within the system, and segment it with conditional filters. As a result, you get a more complete picture of each individual customer. Many CRM systems have accompanying mobile apps, allowing each member of your sales team to work remotely. Whether you’re travelling or just operating from home, you can access the same wealth of data that you’re used to on your desktop computer. Additionally, social media integration is now offered by most providers. Typically, all you have to do is enter a contact’s email information into the system, and the CRM will automatically connect to the social media profiles associated with that email. Leviev, a premium diamond retailer, prides itself on exceptional customer service. The relationship with the customer is just as important to them as the quality of their diamonds. With only a handful of boutique locations spread across the globe, Leviev wanted a way to stay connected with its travelling clientele. Using Salesforce’s CRM, the company was able to track customers’ personal info, as well as purchase and travel habits. In addition to following up on birthdays and anniversaries, Leviev knew if a client, say, traveled to the south of France during the summer. In turn, this helped its international sales force plan the kind of relationship-building activities essential to building a business. The company targeted its clientele at the right time and place, and improved relationships as well as sales. JetHub provides a charter service offering private flights to more than 7,000 airports around the world. The company specialises in connecting their clients with their preferred private jet of choice, whenever possible. As a result, maintaining good customer relationships is key. However, JetHub’s previous CRM was outdated and lacking in some necessary features. Sales agents’ contact lists weren’t secure, allowing anyone to access and disrupt the system. Additionally, the company needed a much more streamlined customer data center, as its employees all worked remotely around the country. The solution? Zoho’s cloud-based CRM system. JetHub was now able to follow up with leads from its website by forwarding them to its sales team. In addition, the company set up important tasks and alerts to give its customers exceptional and personalised customer service. Zoho’s CRM platform is designed to generate sales and streamline work. The company emphasises its system’s ability to automate tasks and improve workflow, while building leads and creating more sales opportunities. Additionally, it can automatically assign leads to particular agents, prioritise prospects, and track and measure all marketing activities. Its plans start at £7.72 per user per month for small businesses, and run through £32.25 per user per month for large, customer-centric organisations. Salesforce is one of the most widely used and popular CRM systems in today’s market. Salesforce claims it can improve customer satisfaction by 37%. The company offers separate sales solutions for B2C and B2B companies, as well as various powerful platforms including Salesforce1 – its mobile CRM service. You can take advantage of individualised self-service portals or complete call center solutions that integrate with the CRM itself. It also offers a marketing cloud platform that lets you connect all of your digital marketing solutions with your contact database. For £17 per month per user, small businesses can use the service’s basic features, Salesforce’s Small Business Solutions. Other plans, such as a standard account for Professional Edition starts at £45 per user per month. Copper CRM integrates superbly with Google and slots seamlessly into the range of tools you use every day. It’s easy to get the hang of, pleasant to look at, and simplifies your workload. So you can cut out the hassle of those dull, day to day duties and get on with driving your business. Plus, you won’t need to trudge through streams of raw data to get set up. Copper CRM captures all your name, number, and email address data, so your network is at your fingertips – and ready to start selling to. Copper CRM offers three tiers of pricing, depending on the size of your business. Monthly prices start from £19 per user and go up to £93 for the premium package. There’s also an option to pay annually and save up to 29%. Maximizer offers an on-premise or cloud-based CRM that includes 3 powerful tools: sales management, customer service, and marketing automation. The company’s highly configurable web-based interface makes data management easy, while its reporting offers pre-built Excel reports and granular analytics for increased sales opportunities. At £35 per user per month, Maximizer offers one major CRM package, which includes all of the expected management features, as well as an accompanying smartphone app for enhanced mobility. Netsuite’s CRM package is great for small to midsize businesses. The software delivers common CRM features such as customer support and marketing automation but also is able to provide quotes, order management, sales forecasting and even integrated Ecommerce functionality. Its all-in-one package allows users to gain a complete, 360 degree view of their customer, although this complex technology comes at a price. Netsuite prices start from £100 per month and are charged on a subscription basis. This is expensive compared to competitors, but for some businesses the benefits of using a CRM with real-time, fuss-free integration outweigh the high cost. Contact Netsuite directly for a customised quote. The price of CRM software depends largely on the size of your business. However, even small companies can take advantage of feature-rich systems without breaking the bank. At the lower end of the scale, Zoho offers a plan at £7.75 per user per month. The system is basic, but still meets the needs of smaller businesses that want to manage and optimise customer information. The more expensive CRMs like Salesforce and Netsuite can offer dynamic solutions for an enterprise organisation. At £161 per user per month, Salesforce’s CRM plan is ideal for managing a large number of contacts across multiple channels.